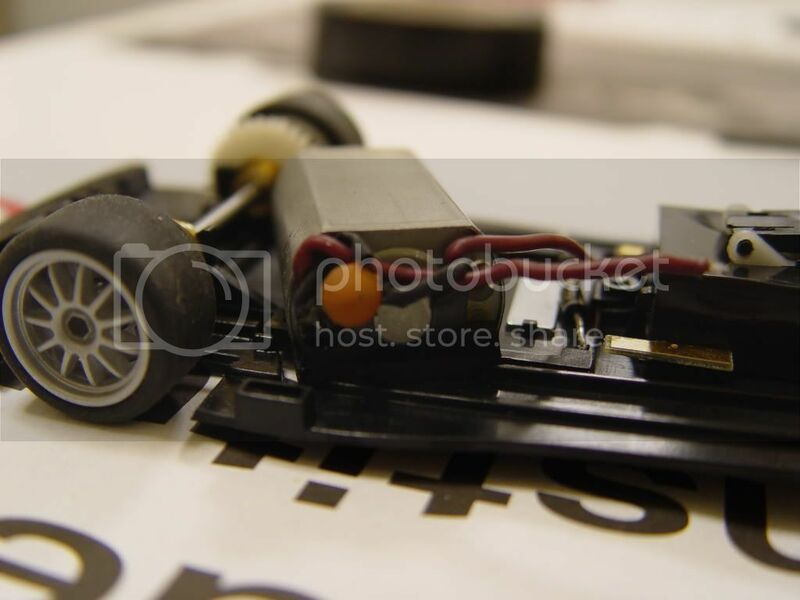 Hello, I've just bought a Spirit Peugeot 406 Silhouette Digital (red) and the car is running really fast, but in my SCX digital track I can't pit (put gas), when I press the button in the box nothing happened. And both my chronometer and my lap counter don't recognize the car (the laps don't increase and the time keeps in 0.00). If anyone can help me, I appreciate. Is that a bug or there is some fix/setup? It's time for yet another "how-to" and this time it's something that has been on the minds of quite a few of us that happen to own Spirit digital cars. So let's start w/ taming this motor for the betterment of the digital chip. This is an idea that was presented to me by Brian of BRS Hobbies based on information he was able to glean for a similar project utilzing a Ninco set-up. Obviously, I don't want to take credit for something that was not my idea so instead of placing any tech data on this thread I'll present the links so you can read up on it yourself (besides, the original authors are much better versed at explaining this concept than myself). This circuit is intended to give me a mild reduction of top speed (based on some early test, I'm guessing the car's speed is about 90 to 95% of what it used to top off at) and give my car a bit less braking so that it coasts longer when my accelerator is released. A true test of how this system works will be provided next week after I have my big weekend race. So stay tuned for my findings. I will update this thread again @ that point. 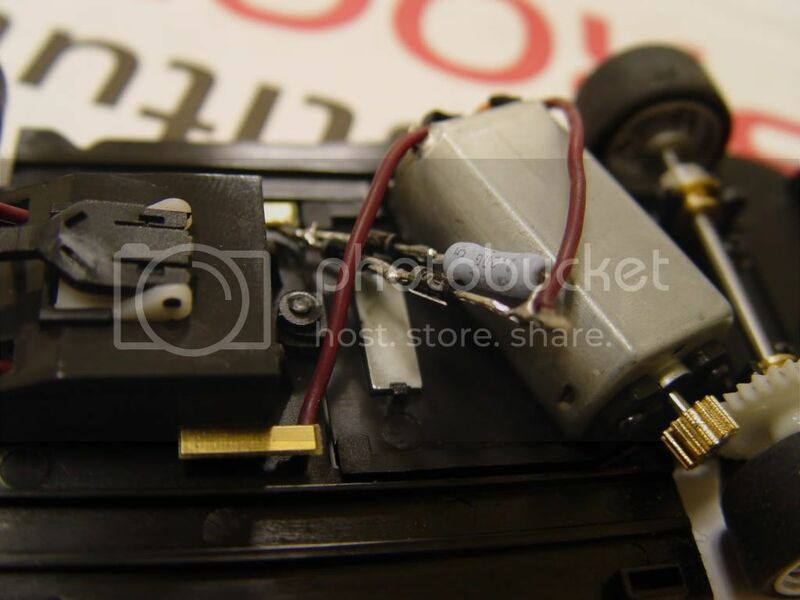 For now, let's take a look at how I installed this circuit in the Spirit car. 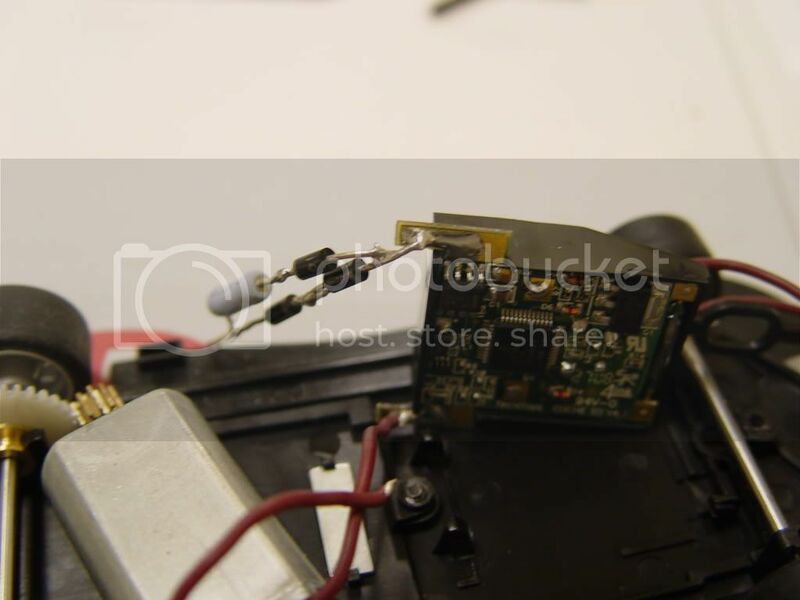 The first step is to simply de-solder the wire attached to the "positive" lead of the chip (the right side) that goes to the motor. The "negative" side will be left untouched. Next, solder the new circuit in place as shown in the pic below (I also angled the circuit so that it will end up resting alongside the motor). Now the set-up is complete w/ the positive motor lead now tied into the circuit. 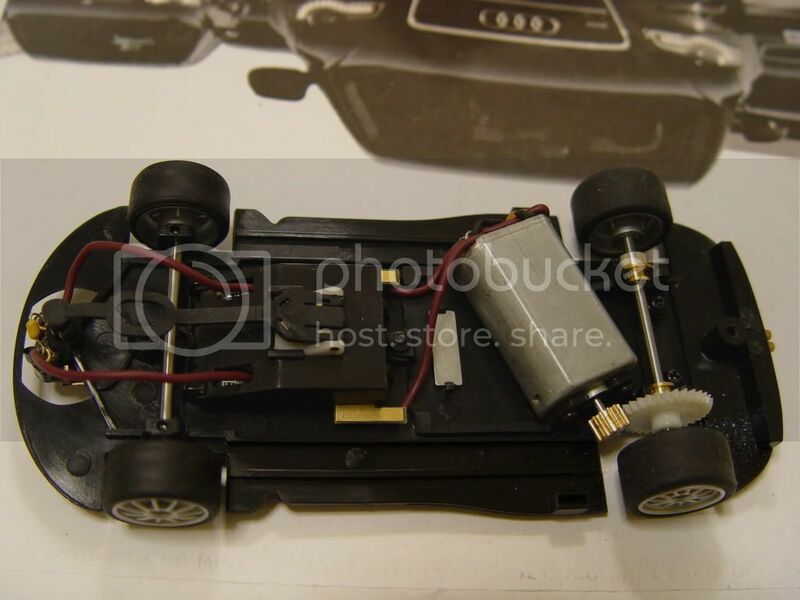 On another note, I should mention that due to the placement of the new magnets, I did notice that when the car is running "without the body", the extra magnetic force did drag the car lower as it passed the start/finish line and then caused a short that disrupted power. The reason this occured was because the motor casing on the car was dragged down further by all the magnets and then it touched the track rails. 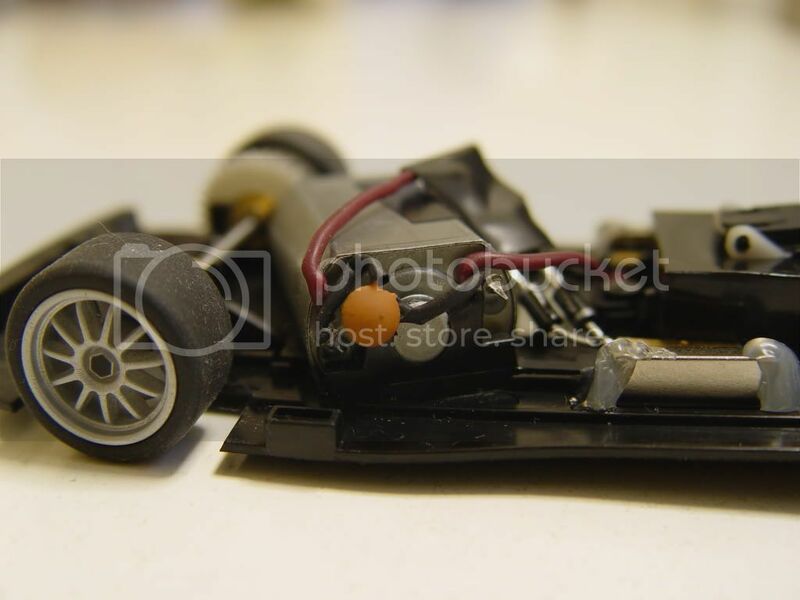 This is not really an issue so long as the body of the car is attached and thus providing more stiffness to the chassis to prevent flexing (Spirit chassis' are thinner compared to an SCX chassis). So that's it for now. My big race is now two days away and I'll be performing test on both 406's (one that is modded and the other in stock form) to compare their speed and braking differences. I'll be back sometime next week to update this thread. Last edited by LDFan; 07-04-2009, 12:32 AM. Hi, Dave, thank you very much for the quick reply. I think the procedure you have described is a great solution for the problem #1, thanks! About the problem #2 (The car doesn't register laps or re-fueling (same thing) on a consistent basis) I didn't found the solution, can you point me the thread that talks about this problem? Again, tTks for your great support! About the problem #2 (The car doesn't register laps or re-fueling (same thing) on a consistent basis) I didn't found the solution, can you point me the thread that talks about this problem? Sorry Francisco regarding how I wrote this post. I didn't really emphasize problem number 2 as well as I should have. To recap, the problem w/ registering laps on the Spirit (and Sloter) cars is that you need to add extra magnets beside the digital chip. If you notice the last pic, there are additional bar magnets in the picture. The reason this is an issue has a lot to do w/ the anglewinder and sidewinder motor arrangement on the Spirit and Sloter cars. The magnetic polarities are not right to properly activate the reed switchs in the SCX Digital track. In the future, both Spirit and Sloter will be rectifying the issue on the next production batch including Spririt's intent to provide a less powerful motor. Last edited by LDFan; 07-04-2009, 08:35 PM. Thank you, Dave, now I see, I will try to buy a couple of magnets to fix the car. I have bought this car yesterday and i got the same problems that you already report, refuel and lap counting. But i have another issue, my Peugeot 406 SCX Digital automatically changes lane without pressing the rear button. Is that normal? What can i do? Not sure if you're still looking for this information but I thought I answer it anyway (just so you know, I never noticed your posting until now because it's rare I visit the Spirit section). Anyway, the problem you're obviously having is that the return spring "inside" the guide has popped out and thus w/o the spring the lane change plunger stays down and keeps forcing the lane change gates to keep changing lanes. The only fix for this is to get a new guide but unfortunately this Spirit/Sloter design has never been available as a spare part. 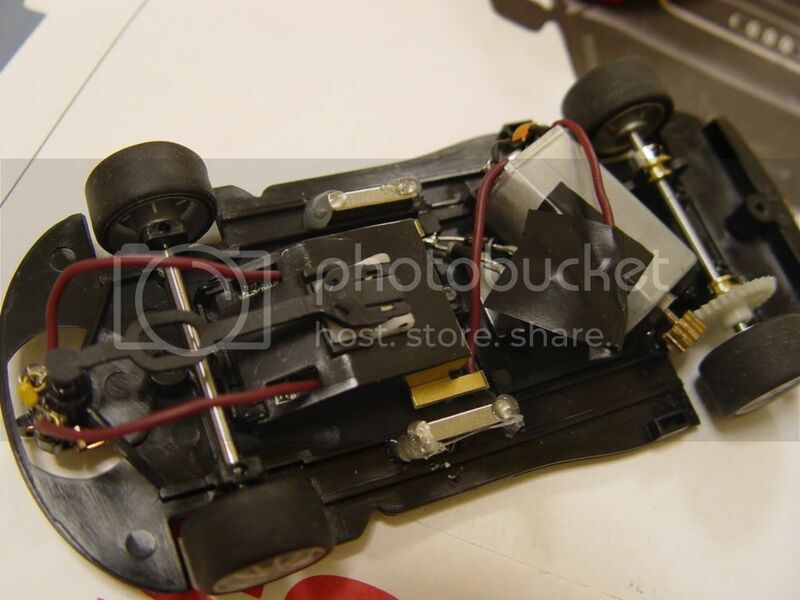 Thus, you'll have to use an SCX F1 guide as a replacement and slightly alter it to work with the Spirit car (basically, you'll need to solder the leads on to the top of the braids and cut off the steering column on the back of the guide). And as an FYI, I had this problem as well a few months back and discovered that there is a minute difference with the way that Spirit/Sloter designed this guide that causes the spring to pop. On this guide, they have utilized a plastic washer on top of the lane change plunger as a means to keep the spring in place. Unfortunately, the washer is not glued down in anyway and simply pressed fit to stay in place. Hence, when my car was oddly jammed into a X-Over slot because of a stuck LC plunger, it broke loose as I pulled the car away. I was luckily able to find all the parts to put it all back together but it was a pain to discover that this could happen (imagine getting on your hands and knees and trying to find a tiny plunger and spring on a 120 foot layout). Hope this helps even though it was a late reply. LDFan, I'm going to convert slot.it car to scx digital, and I have a question about cirquit, where you limit power consumption of fly motor. I'm not big specialist in electric, but why you connect diodes into different directions ? Woudn't 2 low diodes act like big impedance for DC? Isn't enough to use only 1 diode and 1 resistor in top line? Do you have current value for scx motor at full throtle? The motor in slot cat that i'm going to purchase - is flat-6, 12V 20500rpm (current not known up to now, but I think it higher, then SCX). to SCI! This is an old Thread but hopefully someone will be able to help out. I asked this same question to my brother in law electrician the other day (after following LDFan's awsum advice on another thread) and even though my brother in law does not deal with small electronics such as this he did say that DC voltage operates in both directions and from what he could see the diodes only work one way. If you place them in both directions apparently one set controls the throttle limiter while the other set controls the brake limiter. LDFan also stated in another thread that it does not have to be 2 diodes in each direction...it can be 1, 2, or 3 in each row if desired. Whichever best suits your performance needs can be used. One thing that I did not see in the other thread however is the resister used in this picture...the other diagrams only included the diode set up. My diodes just came in and ready to start soldering myself. LDFan please confirm or correct any of this information. You can also swap that motor out for an NC-5 or an NC-2 and forgo the diodes and resistors. Diodes only pass voltage in one direction. 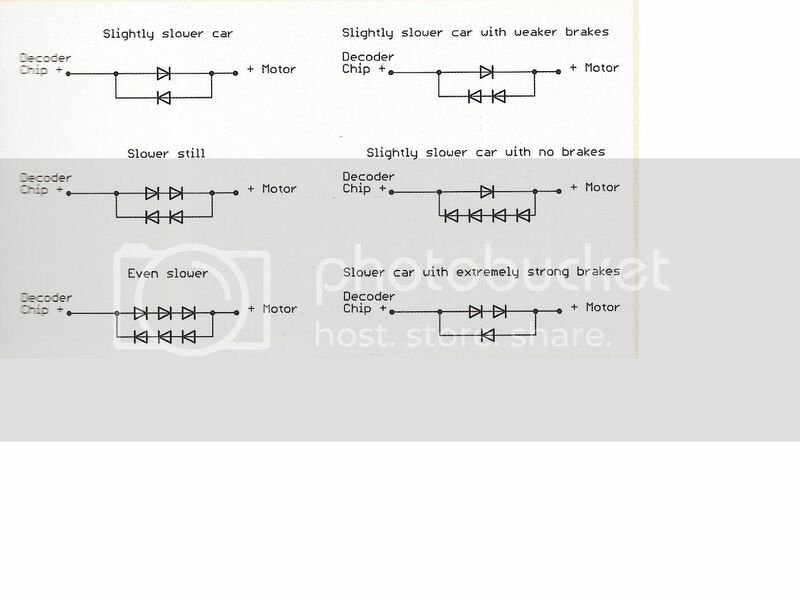 The purpose of having the diodes set-up in this two direction manner on the postive side is because one direction handles the throttle and the other direction deals w/ braking in the form of subtle reverse voltage. This is something very common in analog racing when you see some of the mid to high end controllers (the one's with three wire connections to the track) utilizing adjustment knobs vary the throttle and braking curves. Here is the diagram provided by Dave Chang from his book "Digital Slot Car Racing"
Some people may want to mix and match various set-ups to achieve a certain throttle curve. Honestly speaking, the resistor seemed to hamper my initial acceleration so I will probably drop it and exchange it for another diode or two (or just have only two diodes for acceleration). It's an ongoing experiment that I'll eventually work on again. You can do that too. I'm not sure how the adapters and motor mounts will fit in the Spirit chassis however. Can you confirm if the motor can be screwed down properly since the original motor is set-up that way?